Conventional resistivity surveys, whether for areal pa mapping or assessing soil resistivity changes with depth, proceed at a relatively slow pace, because electrodes need to be pulled from the ground, moved, and then reinserted before the next pa measurement is obtained. Computer-controlled multielectrode systems are certainly an improvement over conventional equipment with respect to resistivity survey efficiency; however, there is still a considerable amount of initial setup time needed, especially in cases where 100 or more electrodes need to be installed. 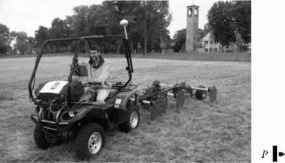 Development of continuous resistivity measurement systems began in the middle 1980s to the early 1990s, with researchers first in France and then Denmark, and this technological innovation dramatically expanded the use of resistivity methods for agricultural purposes. These continuous resistivity measurement systems allow pa to be measured at a fast rate along a transect without the need to repeatedly insert and remove electrodes. Continuous resistivity techniques can be divided into two types based on the manner in which electric current is applied to the subsurface; one uses a galvanic contact approach, and the other employs a capacitive-coupling approach. The term "galvanic contact," when used to describe resistivity methods, implies that the current electrodes are in contact with the soil surface, and there is a direct transfer of electric current between the current electrodes and the soil. Conventional resistivity surveys and the computer-controlled multielectrode systems previously described both employ galvanic contact to introduce electric current into the subsurface. Perhaps the greatest advance with galvanic contact continuous measurement systems was in the design of electrodes capable of maintaining good electrical contact with soil while continuous pa measurements are collected as the electrode array is pulled from one location to another. It is important to note that contact resistance can be a problem with all galvanic contact methods, and it occurs when resistivity is very high at or just below the ground surface where the electrodes are placed or inserted. This situation can arise when the ground surface is extremely dry, frozen, or covered with snow or ice, thereby making it difficult to transfer electric current from the current electrode into the adjacent soil (Reynolds, 1997). When conventional resistivity equipment or computer-controlled multielectrode systems are being used, this problem can often be solved simply by using a saline solution to wet the soil surrounding the inserted current electrode. This tactic for addressing the contact resistance problem is not feasible when conducting resistivity surveys with galvanic contact continuous measurement systems, and as a result, these types of surveys should be avoided under snow- or ice-covered or frozen ground conditions, and maybe even when the soil surface is extremely dry. respect to the two pairs of potential electrodes enabled the system to measure pa with two Wenner arrays, one 30 m in length and the other 90 m in length, thereby providing two different depths of investigation. Based on information provided by Loke (2004), a 30 m Wenner array has a median investigation depth of approximately 5 m, and the median investigation depth for a 90 m Wenner array is about 16 m.
FIGURE 5.6 Veris 3100 Soil EC Mapping System: (a) photo of system in operation, (b) close-up of steel coulters used for current and potential electrodes, and (c) schematic of electrode spacing and arrangement (C = current electrode, P = potential electrode). electrode array configurations (Figure 5.6c). The shorter Wenner array (0.7 m) maps the top 0.3 m of the soil profile, and a longer one (2.1 m) maps the top 0.9 m of the soil profile. As indicated by Figure 5.6a and Figure 5.6b, these electrode arrays are oriented perpendicular to the direction of travel while pa is being measured. The first galvanic contact continuous resistivity measurement systems were probably developed in France (Dabas et al., 1994). The ARP-03 (Figure 5.7a) is one of these systems and is marketed by Geocarta SA. This system is integrated with a GPS receiver for accurate determination of pa measurement locations. A radar triggered pa measurement is obtained for every 0.2 m of travel. 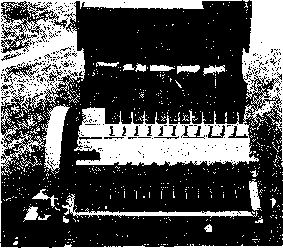 Steel coulters serve as electrodes for the ARP-03. To improve ground contact, metal spike extensions are attached along the outer circumference of the coulter electrodes. The plan view arrangement of the ARP-03 electrodes is depicted in Figure 5.7b. As shown, there is one pair of current electrodes and three pairs of potential electrodes. The arrangement shown in Figure 5.7b provides for three electrode arrays (one current electrode pair and one potential electrode pair), with each array having a trapezoidal configuration. Investigation depths for the three ARP-03 electrode arrays are 0.5, 1, and 2 m.
Capacitively coupled systems are also capable of collecting continuous resistivity measurements. As the name implies, these systems use a capacitive-coupling approach to introduce electric current into the ground and to measure potential differences at the soil surface. This capacitive-coupling is accomplished using coaxial cables. Essentially, a large capacitor is formed by the coaxial cable and the soil surface. The metal shield of the coaxial cable is one of the capacitor plates, and the soil surface is the other capacitor plate, with the outer insulation of the coaxial cable acting as the dielectric material separating the two plates. The system transmitter applies an alternating current (AC) to the coaxial cable side of the capacitor, in turn generating AC in the soil on the other side of the capacitor. With regard to the receiver, a similar phenomenon occurs, except in reverse. The AC in the soil charges up the capacitance of the coaxial cable, which is measured to determine the potential difference (voltage) generated by the flow of electric current within the soil. Two coaxial cables are attached to the transmitter, one on each side, to form a current dipole. Two coaxial cables are also attached to the receiver, one on each side, to form a potential dipole. This equipment setup, along with some initial data processing, allows a capacitively coupled system to mimic a conventional galvanic contact dipole-dipole electrode array having one pair of current electrodes (current dipole) and one pair of potential electrodes (potential dipole). Similar to a galvanic contact system, a capacitively coupled system determines pa (or oa, ECa) using measured electric current, measured voltage, and array characteristics, which in this case, are the coaxial cable dipole lengths and the distance between the two dipoles. The spacing between the two dipoles governs the soil investigation depth, given that the dipole lengths remain constant. As previously mentioned, the transmitter in a capacitively coupled resistivity measurement system generates alternating electric current. The higher the AC frequency, the better the capacitive coupling, and the more electric current is coupled to the ground. However, higher frequencies also generate some unwanted electromagnetic effects that adversely influence resistivity measurement. A transmission frequency of between 12 kHz and 20 kHz is a good compromise between the need for a low enough frequency to avoid unfavorable electromagnetic effects on resistivity measurement and the need for a high enough frequency to get good current coupling to the ground. There are some advantages and disadvantages for capacitively coupled resistivity measurement systems when compared to galvanic contact systems. Capacitively coupled systems can be used in areas covered with pavement, whereas galvanic contact systems, with electrodes that need to be inserted into the ground, usually cannot be employed in these settings. In soil environments with high resistivity, it is often difficult when using galvanic contact continuous measurement systems to adequately transfer electric current from a current electrode into the ground, a problem previously referred to as contact resistance. This problem does not occur with capacitively coupled systems; therefore, these systems are a good choice for use in high-resistivity soil environments. Conversely, capacitively coupled systems do not work well in low-resistivity soil environments because the potential dipole voltage becomes too small to be measured reliably. Increasing the amount of electric current transferred into the ground would solve this problem, but this tactic is not easily accomplished with capacitively coupled systems. Furthermore, due to limitations on the amount of electric current that can be transferred into the ground, the maximum investigation depth achievable with a capacitively coupled system is around 20 m, which is much less than what can be obtained with a galvanic contact system. The OhmMapper TR1 (Geometrics, Inc.) displayed in Figure 5.8 is an example of a capaci-tively coupled continuous resistivity measurement system. The current and potential dipoles can be 5 or 10 m in length and are composed of two coaxial cables integrated with either transmitter or receiver electronics. The transmitter generates a 16 kHz alternating current. The OhmMapper TR1 also has a battery power supply, a data logger console, and rope that separates the two dipoles from one another (Figure 5.8). The depth of investigation can be adjusted by lengthening or shortening the rope separating the current and potential dipoles. Continuous pa measurements are collected at time intervals as short as 1 sec. The OhmMapper TR1 can be integrated with a GPS receiver for accurate determination of the resistivity measurement locations.